When you want to purchase kettlebells, there's a lot to think about. Where should I buy them? Do I really need them? What size should I start with? I went through all of that. And while kettlebells are not magic, they are very useful pieces of training equipment. Where Can I Find Cheap Kettlebells? There are tons of kettlebell suppliers around. And many times it's hard to know which is the cheapest, and that's also quality. An easy and simple way is to check in your local newspaper's classified ads. It only takes a few minutes to check and see if there are any kettlebells there, and you might be able to pick one up cheap locally. But, finding them online is probably easier. If you click not the link above you'll find a page where I've compared 8 different major kettlebell suppliers on the net, and their prices. The cheapest one's I've been able to find online are BudoVideos's Kaizen kettlebells. They undercut the price of all the other kettlebell suppliers online that I can find. So, What Size Kettlebell Should I Start With? You want to start with something that will challenge you slightly, but that you can still do all the exercises with. This takes a good balance. Ideally you can try out a friend's kettlebells, or you have a local gym with them. Just find which a weight that feels right; one that you can use to get a workout without breaking yourself. Barring that option, most kettlebell instructors/gurus recommend that women start with a 6 - 8 Kg kettlbell (13.2 to 17.6 lbs). Most men should start with a 16 Kg (35 lb.) one, which should be just about right. Why Should I Even Purchase Kettlebells? You should purchase kettlebells if you (a) want something new for your workout routine, (b) don't like just lifting dumbbells and barbells, (c) you want to be more effective in combat sports, and/or (d) you don't have much room. Well, that's a lot of reasons! But they aren't all good. 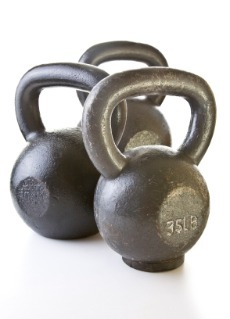 Kettlebells can be pretty expensive, and when you get stronger you have to buy a heavier one. Of course, you can try adjustable kettlebells - but those have other drawbacks. Like scuffing up your forearms & being time-consuming to convert from one weight to another. Check out the link above to a page that concisely deals with the advantages (and disadvantages) of buying kettlebells. Once you purchase kettlebells you need to learn how to use them. What exercises you can do, how to do them and not get hurt, etc. There are a number of books on that market that give instructions for using kettlebells. These are better than nothing, but only so much can be conveyed in pictures. A video or DVD really is best. You can actually see the instructor doing the exercises, which is much more helpful than just a beginning-position and an ending-position picture. • Click here to learn more about the Kettlebells & Kettlebell Workouts! • Click here to leave 'Best Places To Purchase Kettlebells' & go back to the Complete Strength Training Home-page!